I recently asked all my subscribers to answer a few questions in a survey. One of the most popular requests I received was that I write more about the logistics of moving abroad. That’s completely understandable – it can be intimidating to move to a new country with different legal and financial systems, plus a completely different culture. I have learned a lot between traveling and living in various countries. But there is one incredibly valuable lesson I learned early on that has helped me to adjust to life in another country time after time. This lesson is simple to say, but powerful in meaning: Be flexible. The only unsuccessful expats I’ve ever met have all been missing that single trait. If you cannot be flexible and adjust to circumstances around you, you will be unhappy and you will not stay in your new country. I’ve seen it many times and it is very easy to identify the main issue. So what does it mean to actually be flexible? Here’s what I’ve seen many people do, which never works: People move to another country, but they want it to be just like their home country. This is your reality check. If you want to keep your Walmarts, McDonalds, Home Depots, and Whole Foods chains then you need to stay in the U.S. I am not saying this to be mean, I’m saying it to help you avoid a huge mistake. If you want to live in another country, you must accept and enjoy the fact that it is different from home. Aiming to move abroad to save money – especially in your retirement – is a fantastic idea. Understanding that moving abroad means your daily life will change is the crucial component to enjoying that more affordable retirement. Again, I’m not trying to ruin your dreams. What I do need you to understand is that moving to another country requires flexibility. Participating in a different culture requires flexibility. Learning a new language requires flexibility. Trying new foods requires flexibility. Successful daily interaction with people who are different from you requires flexibility. Anyone can physically move to another location anywhere on Earth. But the successful expats are the ones who embrace and enjoy their new homes for everything they offer: the good, the bad, and the ugly. Think of moving overseas as a new relationship: you can’t start a new relationship with the intention of changing everything about the other person. You can’t “fix” someone else. You either love a person for who they are and who they want to be, or you move on to find a better match. The same goes for living overseas. You can’t move to another country with the intention of making it more like your home country. That makes you a colonizer, not an expat. So while this might all sound a bit harsh, I think it is vitally important to your own happiness that you be honest with yourself and that you truly evaluate your wants and needs before embarking on such a huge life change. The first step to moving abroad is not researching flights and apartment rentals. The first step to moving abroad is evaluating yourself: evaluate what you want, what you need, what you love, and what you hate. The first step to moving abroad is honestly assessing whether or not you can be flexible enough to live in an entirely new place. If you cannot or do not want to be flexible on where you shop, what you eat, or how you travel then you should consider staying in your home country. For the U.S., you can still find islands to live on that have those familiar amenities, or you can find cheaper locations to retire to without losing the comforts of home. Whatever fits your life and your definition of happiness is what you must seek. If, however, you honestly and realistically decide that you can be flexible and that you want to shake up your lifestyle – if you decide that you’re ready to accept, embrace, and enjoy whatever changes come your way – then you might truly be ready to become an expat. 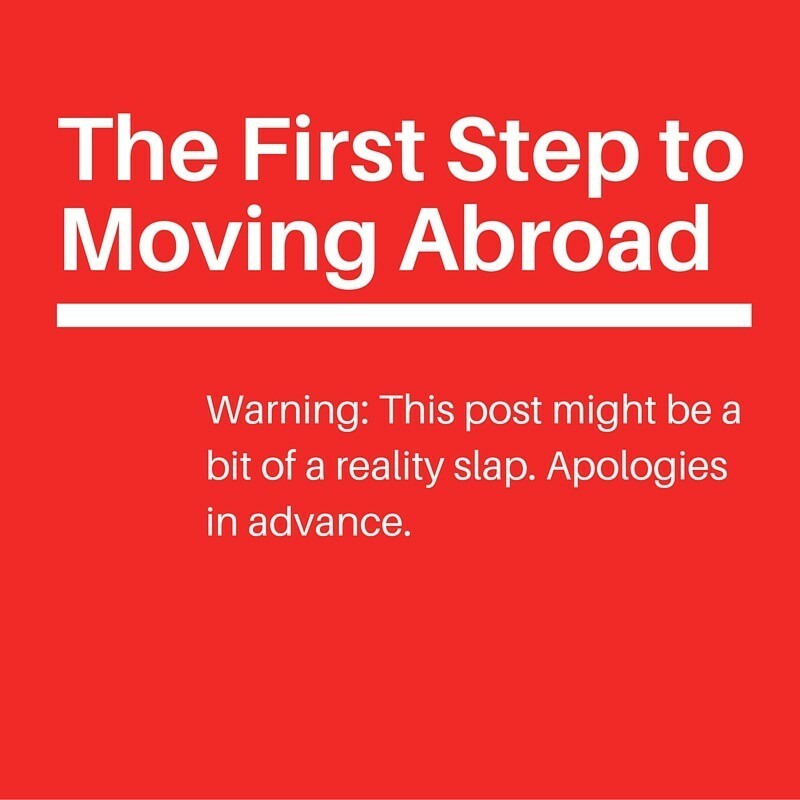 Check out the next step to moving abroad and let me know what you think!